The deeper 1800R screen curvature allows your eyes to track smoothly. In clinical tests this reduced eye strain when compared to viewing a flat screen. Eye Saver Mode reduces eye strain, providing a comfortable viewing experience. Flicker Free technology minimises distracting screen flicker. 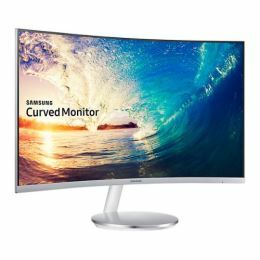 Samsung’s Active Crystal Colour technology supports a wider range of colours than its standard monitors for richer, more vibrant colours and vivid picture quality. Samsung’s advanced VA panel technology and 3000:1 contrast ratio deliver deeper blacks and brilliant whites. By synching screen refresh rate with image frame rate, AMD FreeSync ensures flawlessly smooth gameplay. Instantly optimising screen colours and contrast, Game Mode ensures you get to see game scenes at their best. The rapid 4ms video response time renders even the fastest on-screen movement. Sculpted front and rear panel curves combine with a glossy finish in a stylish design. The simple circular stand blends form and function to provide stable support with elegance. Built-in dual stereo speakers: Dual 5-watt speakers embedded into the display let you enjoy movies, games, and online content without cluttering your desktop. Triple connection interface: HDMI, DP, and D-sub ports provide a connection interface that lets you hook up other devices with ease.